Version 4.3 Released: Tags, Trailers, Push, and more! Good news everyone! App has been updated to version 3.0! I’ve been testing this version for a while and feel that it is ready to be released. Let me know how you like it! – New custom design to make the app more streamlined for the casual users. 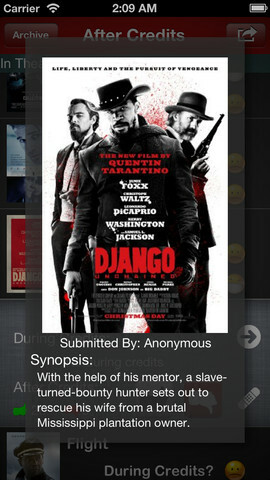 Now whenever you tap on a movie, it will expand and allow users to vote if there was a clip during/after the credits. It looks slick and hope everyone likes it! 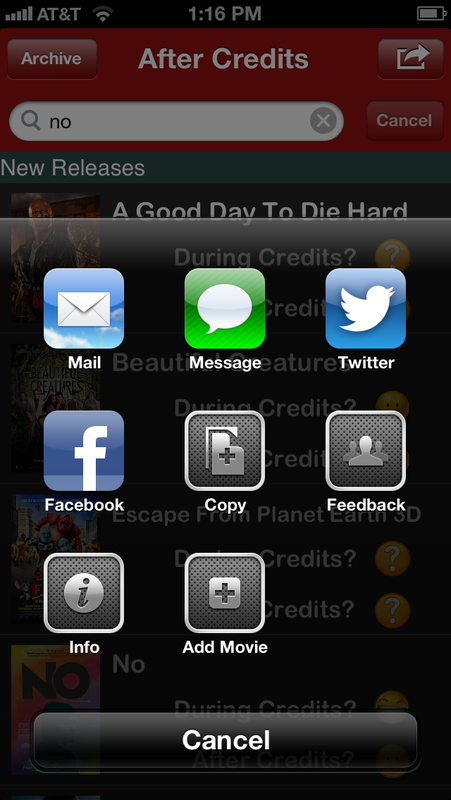 – Sharing options for iOS 6+ users! You can now share the app through your favorite social media so that your friends can find out about the app! 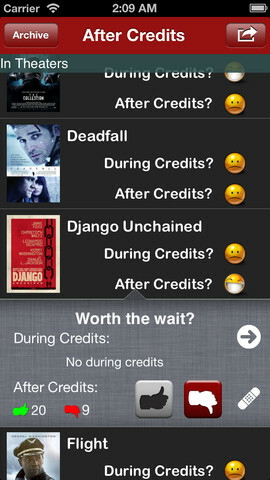 Also the info, add movie, and feedback have their own icons now so that it’s a little bit more recognizable. – Better sorting! Movies are coming out almost everyday now. Before I designed the sorting so that it would only sort friday movies. Now that movies are coming out on wednesday and Thursdays (Valentine’s day), I decided that the new releases section will include all movies that are coming out in the week. No more friday confusions! – Better refreshes. It now refreshes the app better than before and only refresh it when it needs to! You can download this app update here. This entry was posted in Uncategorized and tagged After Credits, Anything After, App Store, App Store Update, Apple, Clips, Credits, During Credits, iOS, Movie, Movies, Search Movies, Waka Waka Zaku. Bookmark the permalink.